Meet on arrival at Leh Airport by our representative and transfer to the hotel. Rest of the day free for rest or leisure to acclimatize. Evening you may visit Leh Market and Shanti Stupa. Overnight stay at hotel. After breakfast proceed for Indus Valley Monastery tour including Shey, The ancient capital of Ladakh, Thiksey an impressive complex rising tier upon tier on a hill above the village, Stok Palace & Sindhu Ghat. Evening back to the hotel. Overnight stay at hotel. After breakfast drive from Leh to Likir, app 2 hours drive. On arrival at Likir you will meet all your trekking staff and ponies. One can visit Likir monastery situated on a hill towards the village. 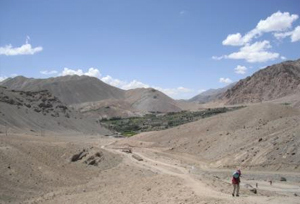 Start your trek through a barley field to cross a small stream and then to village Sumdo. Then gradually trek to village Yangthang to camp. Overnight stay at camp. After breakfast Trek to Wulle valley and then ascent for one hour to Shemchan La and then descent towards Hemis Shukpachan, the highest village in this route. It’s a big village and is famous for Cedar trees found in plenty here, hence the name of village. We will visit a family house and have some butter tea and Ladakhi chang (the local beer). There is a small but beautiful monastery just outside the village that we can visit. Overnight stay at camp. After breakfast We trek through the Apricot rich village of Ang and This valley has warm weather as compared to Indus valley and hence conducive to thick vegetation and hence there are plenty of apricots, apples and nuts making it one of the richest valleys in Ladakh. Since people are rich they have beautiful houses with wonderful interior. Overnight stay in Uleytokpo Camp. After breakfast visit the Lamayuru monastery to be part of the morning religious ceremony. It’s a very soothing and spiritual experience to be there among these warm and friendly monks. Later drive back to Leh. 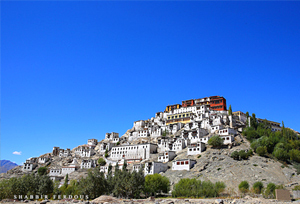 On our way to Leh you can visit the Basgo monastery also, famous for its Buddha statue. On arrival at Leh check-in at hotel. Overnight stay at hotel.